This is decadent to the max and a great way to start the week, or a wind down at the end of a hard weeks skiing. Champagne Chicken is a new dish for you this Christmas, and we are really excited to offer it to you. Think of it as a present, from us to you. 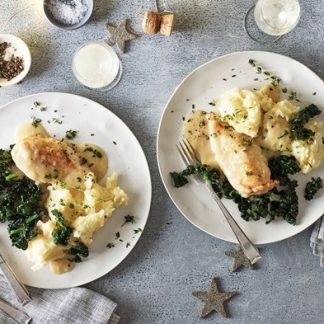 Tender chicken breast, slow-cooked in a delicate cream and Champagne sauce, with shallots and thyme. Why not have a look at our ludicrously good white wine list for some inspiration? It is Christmas, after all. 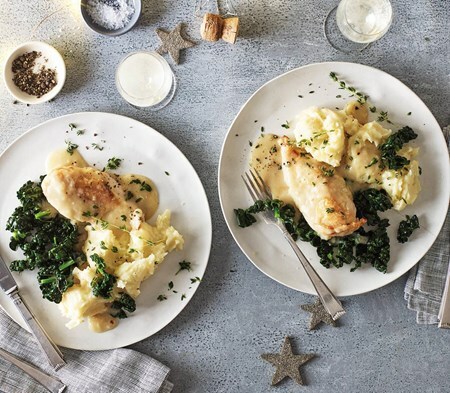 Chicken Breast (44%), Water, Shallots (10%), White Wine (contains: Preservative: Sulphur Dioxide), Champagne (7%) (contains: Preservative: Sulphur Dioxide), Double Cream (3%) [Milk], Roast Chicken Stock (contains: Roast Chicken, Maltodextrin, Salt, Natural Flavouring, Chicken Fat, Sugar, Lemon Juice Concentrate, Dried Onion Powder), Wheat Flour (contains: Calcium Carbonate, Iron, Nicotinamide (Vit B3), Thiamine Hydrochloride (Vit B1)), Butter [Milk], Chicken Glace (contains: Concentrated Broth from Chicken Meat (Water, Extract), Maltodextrin (Potato), Yeast Extract, Salt, Glucose, Onion Powder), Thyme, Lemon Juice, Rapeseed Oil, Bay Leaf.